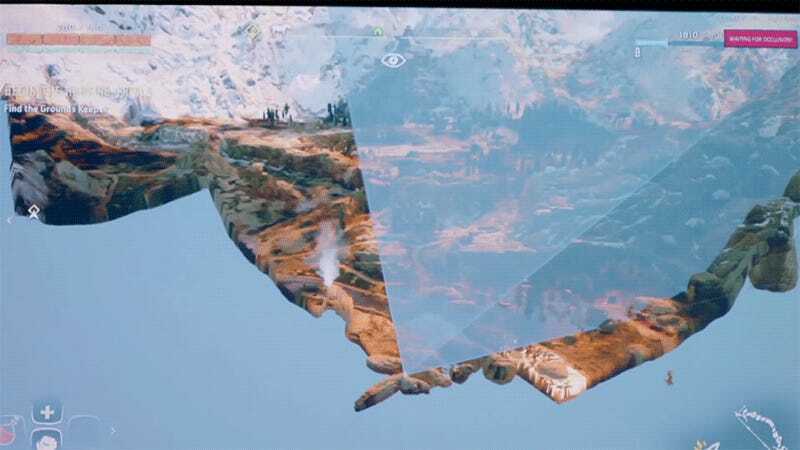 Every time you move the camera in Horizon Zero Dawn, the game is doing all sorts of under-the-hood calculations, loading and unloading chunks of world to ensure that it all runs properly. And that’s not even counting the robot dinosaurs. In a new 45-minute documentary produced by the Dutch organization VPRO, the developers at Guerrilla Games give us a fascinating glimpse at how they created their post-post-apocalyptic versions of Colorado and Utah. One of my favorite parts is the GIF above, at around 18:16 in the documentary, which shows how the game is secretly rendering giant chunks of terrain on the fly as you move your camera around. You can watch it all here. Make sure to put on English captions—some of it is in Dutch. This process, which at this point has become common in open-world games, helps conserve memory, which allows games like Horizon to show you a whole lot of pretty graphical models at once without sacrificing performance. Game development: It’s complicated!